Mia The Reader – Page 3 – Reading books, scribbling words, and loving family. Everyday Holy is a collection of short devotionals, good for gently waking my brain up a bit in the morning. This is the third devotional I’ve read this year, which is…surprising. I used to dislike the idea of devotionals, but there are times when self-directed study gets hard…when you’re super busy or groggy from lack of sleep or simply a bit apathetic and you need a starting point to get you thinking in the right direction. I always appreciate Melanie Shankle’s blend of humor and honesty, and her constant grappling with the mundane, circumstantial elements of life that can numb us to the life believers are called to and graced with in Christ. My current morning reading practice is half a chapter of Proverbs (I spent the first six months of this year in Psalms and now I’m moving on! ), a day or two from Everyday Holy, and a chapter of The Liturgy of the Ordinary or Give Them Grace. (Yes, I read a lot of books at once. No, I do not have ADD). The Liturgy of the Ordinary is mostly about worship during the mundane chores and tasks we do each day. We fight in this culture against constant entertainment and a fear of the ordinary. Tish Harrison Warren explains in her book how she’s reconciling the ordinary with the sacred and coming to view them as not so separate after all. I liked parts of the book, though I don’t agree with all the author’s viewpoints. On finishing it, I’d give it 2.75 stars. I think I’m going to need to dig into The Quotidian Mysteries by Kathleen Norris next, because this book quotes it often! My biggest yet most unimportant beef with The Liturgy of the Ordinary Day is that the text is constantly interrupted with bold main points. Listen. I know this is a common practice in non-fiction publishing right now, but I hate it. I already read that sentence, and you’re interrupting my train of thought to read it again??? No. Put it off to the side in the margin if you must, but here’s a thought: maybe you should trust your readers to read the page of text and gather the main points on their own, intelligent selves? This may come as a shock, publishing world, but we are capable of drawing conclusions and recognizing the heart of the message. Thank you, rant over. (But don’t get me started on back and forth, present to future viewpoints in historical novels…gah! Hate it. (See, told you I don’t have ADD. What’s the opposite? Complete focus at the expense of all else? Tunnel vision? I have that)). Now, onto the cookbooks! I may have mentioned three or three hundred times that meal planning and prep is the bane of my daily existence. This summer, I’m out to conquer my struggles by keeping simple meals on repeat. Usually what happens is I swing from an uber-healthy eating phase to an “I’m sick of all this food prep give me pizza” phase. I stay in the second phase for quite a while before swinging back, but I feel nagging guilt about it all the time, so I end up avoiding buying “unhealthy” foods because I know they’re poison but then I don’t have the energy or forethought to provide my family with healthy foods and my grocery shopping is all a muddle…and then the week is suddenly a disaster. No, I’m not being dramatic. That’s why I was drawn to Eating in the Middle: A Mostly Wholesome Cookbook. Sustainability? Balance? Yes, please. I have yet to cook anything from it, but the Breakfast Egg Salad and Greek Yogurt Pancakes are on this week’s menu! I haven’t made it out of the breakfast section yet…the photos are beautiful. I have tried two recipes from Smitten Kitchen Everyday: Triumphant and Unfussy New Favorites and they were winners, especially the Chicken and Rice Street Cart Style. Have I ever gotten chicken and rice from a street cart? No. But I will be making this recipe again and again. One of the best parts of these two cookbooks is the authors are not just good cooks but excellent writers; I actually want to read all the text and introductions to each recipe. Not sure how I became a person who reads cookbooks (or a Goodreads friend whose shelves are cluttered with cookbooks…) but I’m pretty sure it has to do with the pursuit of sustainability, haha. On the fiction side of things, I haven’t been hitting the novels very hard. I love being outside in the summer, running around with the kids, doing house projects, swimming, so the cold winter months are really when I do the bulk of my reading. 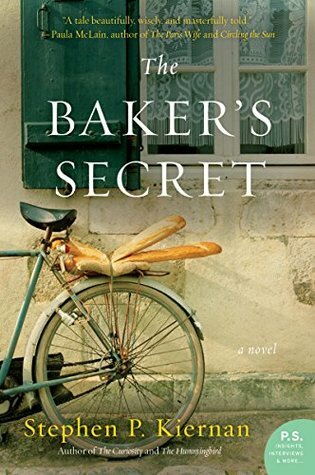 I did read The Baker’s Secret, and really enjoyed it, though there were definitely depressing parts (war novel). If you like WWII historical fiction like The Plum Tree or The Nightingale, you’ll like this book. I also finally got Ronia, the Robber’s Daughter off my to-read list, and mostly enjoyed it, though it was much darker than I was expecting. I won’t be reading it to my kids…it’s more of a YA book, in my opinion. Now homeschool planning for the coming year is heavy on the brain, so my reading habits probably won’t pick up til September or October, but I’d love to hear what your summer reading is looking like! Happy summer! And head on over the Modernmrsdarcy.com to see more of what readers have been reading this summer on the QuickLit feature! It’s pouring rain here…the perfect day for me to tell you about this gem of the book: The Pink Umbrella, by Amelie Callot, illustrated by Genevieve Godbout. This is a children’s picture book, but it’s also the perfectly delightful story for all ages of Adele, a cafe owner in a small village by the sea. Adele is like sunshine to the people around her, but gets very blue on rainy days. In short, Adele hates rain, and the people who love her hate to see her sad. The story develops in a simple way, but it will melt your heart. Yes, The Pink Umbrella is about romantic love, but in the best possible way. The love story is about a slow, abiding, caring, gentle love, not a sweep-you-off-your-feet, love-at-first-sight kind of love our children are so often exposed to in fairy tales and through all kinds of mediums. Beyond a healthy and beautiful love story, the book gives a good picture of how a hard-working, thoughtful, and generous person in seemingly small ways can change the people and places around him or her. Adele is an ordinary woman, not a princess, and this is an ordinary story, but with gorgeous illustrations and a couple of characters you’ll want to know in real life. Make an outing to a library or bookstore to get The Pink Umbrella part of your plans this weekend!